Editor’s note: Please read the comments below. This company has come under scrutiny by consumers. I’ve been noticing more and more people from all walks of life using metal water bottles. At about half the price of other stainless steel water bottles, non-profit Eco Canteen’s mission is to get as many people as possible off of bottled water, since 80% of plastic water bottled are not recycled. Of the plastic water bottles that do make it to the recycling center, 40% of them end up in China or Indonesia. 2.5 million disposable water bottles are thrown away in the US every hour. In 2007, $16 billion was spent on bottled water. 20 oz. of bottled water costs almost as much as a gallon of gas. Discarded plastic water bottles take 700 to 1,000 years to break down. A 20 oz. bottle of water takes 5 oz. of oil to produce and ship. Dioxin, one of the deadliest air pollutants, is created when unrecyclable PVC is separated from PET/PETE #1 plastic water bottles and then incinerated. Switching to a reusable stainless steel water bottle is a simple step your family can take to be greener. There are complains all over the web about these guys, so I would be wary of promoting them. As soon as I heard about the complaints, I removed all references to them from my own site. Just an FYI. David, could you provide more info? I did a quick google search and didn’t see anything. I am curious to hear what the complaints are. Those are just a few. I took the post and complaints off my own site already. The info and statistics are good, thank you. I was unaware of the issue addressed by the above comments, but will look into it. Either way, we do need to reduce the use of disposable plastic water bottles. Thanks David for the links. Anyone wishing to purchase the Eco Canteen should be cautious about shipping costs. This company is NOT a non-profit! This company also does not manufacture their water bottles. They buy them from a promotional company. I can personally highly recommend the Klean Kanteen line of water bottles. I have a a 27oz and my younger brothers have 18oz-ers. The build quality is excellent, including the caps. Which you can get Sports, Loop, Flat, and even sippy for the younger children. The lids that are included are plastic on the inside, however you can still buy the stainless steel lids if you want. The Ecocanteen company is presently in hot water with consumer groups. They have defrauded hundreds of online buyers with excessive charges and non-delivery of product. The bottles are also made in China so the quality of the steel and possible coatings on the metal are unknown. Seek better alternatives, like the trusty Klean Kanteen for one. Paul, Klean Kanteens are made in China too, but they don’t have the consumer group problem of ecocanteen. Thank you for linking back to my Eco Canteen Review! I’ve had several reader complaints about this company, as you can see in the article. I decided to leave my review up, only so people would have access to the reader comments at the bottom. It does seem that this company is running a scam, so buyer beware. You would have to be very careless with your health to use ANY water bottle made in China. Period. I don’t care what the name of the bottle is or what the company says they do to protect you. Find a bottle made in the USA or possibly in a country such as UK, France, Germany, Japan, Canada, Italy, etc…any modern country – but under no circumstances China. All I can say is they are a total ripoff and fraud. Don’t even visit the site. I made the mistake of entering the first page. Then all I go were upsells that no longer made the bottle even competitive. Plust the socalled free insulator cover, comes with a charge of $4.95 shipping which should be covered by the bottle’s shipping. I smelled a skunk so I didn’t finish the order. Well surprise surprise, not only did they enter my order but added extras. All legitimate businesses give you one final chance to change your order or cancel it, but not these people. Once you start, you bought it. Of course untill after the order they tell you a minimum of 4-6 weeks shipping and even then no guarantee when it will be shipped, and from what I have read since, if it ever ships. And no legitimate phone or email for customer service. I wonder why??? Eco-Canteen charged me $20.89 for the bottle and insulated tote–both of very poor quality. I returned mine the next day–had to pay return shipping myself. I called and asked if they would download a shipping label but they said no. They returned only $9.99 to my credit card. The bottle was that much without the insulated tote, which was $4.95. I feel like they have scammed me. I certainly will never buy from them or recommend them to anyone. I want to add my cautionary tale to the list. They contacted every “green” blogger with offers of samples and product information that was in fact misleading and inaccurate. They are defrauding people right and left and the cost of the bottles are offset by the significant s&h costs along with the clever default that sends two bottles regardless. Each bottle is sent with its own s&h costs and they have no customer service or response to any complaints. EcoCanteen is trouble. I have removed anything from my site and recommend you do as well. I want to respond to the suggestions to remove reference to EcoCanteen from Eco Child’s Play. I feel if people are looking for information on the company, the comments to this post are really important. I would not want to remove them at all, as it would make it harder for people to hear these personal experiences. I finally saw a tv commercial for EcoCanteen today. There is no mention at all on the ad or in small writing how much shipping and postage charges will be. This should be a red flag, and it sure seems illegal. There was also no mention of non-profit status in the commercial. Besides the misleading shipping costs, when I received my order, it contained an insulating cover that is bulky and not user friendly. When I called, they told me about the small gray letters under the pictures of the bottles that says “Style May Vary”. WOW, didn’t see that one coming. Thanks Suszie for the tip on Project Earth H2o http://www.projectearthh2o.com – They are genuine and passionate and they donate a % of money from purchases to good causes! I contacted them via email and a customer service rep returned my message within the hour – she even encouraged me to wait a couple of weeks for their new bottles that are coming out that come with both caps at no additional charge. Great company – great cause! While their eco cause is laudable, I have been charged $111 for ordering 4 bottles advertised at $9.99. Stay away from being ripped-off by Eco Canteen grossly misleading advertising. This is a complete waste of time, energy, resources and your health! First WHY CAN’T YOU JUST RE– USE a GLASS BOTTLE??? HELLO you can easily RE– USE A GLASS BOTTLE For free if you buy Perrier, or other ones, GLASS does not outgass metal or metal ions into your water or body= carcinogen big time. Also it causes pollution to create this dumb stainless steel product and is not eco at all to melt metal, print ink on it and all the dumb commercials, it is not even ECO! Save your health, time, money and environment by NOT buying ANY stainless steel products this is giving being ECO A BAD NAME and is dumb! I’ll tell you whats dumb…giving a child a glass bottle and taking them to the beach, pool,shopping, school, etc. Reusable stainless steel might not be the absolute ideal green solution for on the go hydration in a perfect world, but it is better than glass, its better than plastic, and its a start. Awareness is the begining to solving issues. Save your dispersions for people who dont even try, or for those who suggest giving a child, or even some adults glass bottles. This is EcoCanteen Customer Service. We have read this blog and have noted that there are some frustrations, particularly with the order process and the pricing. To better clear this up, we want to address these points. The web platform and order process that EcoCanteen uses is identical to almost every Infomercial or Direct Response TV (DRTV) product advertised. There are three major companies in the United States that design, build and maintain websites for most of these companies. We use the largest of these firms to design and host Ecocanteen.com.. DRTV websites, like Ecocanteen.com, commonly have a simple landing page that shows the commercial, gives details about the product advertised, displays all pricing and shipping/handling costs, and has an order form. Once customers complete their purchase by clicking the “Process Order” button at the bottom of EcoCanteen.com, they are taken to a series of other product pages where they can add additional items to their order. After several pages, which all display the pricing and shipping/handling, the customer sees their receipt page. Our prices are clearly stated on the home page of http://www.ecocanteen.com. The EcoCanteen is $9.99 plus $5.95 shipping/handling and comes with a bonus insulated tote plus the shipping of $4.95. All together one adult bottle with an insulated tote comes to $20.89, which is less than Klean Kanteen and other competitors we’ve price checked, and their prices do not include a tote. Customers are also asked if they would like to upgrade to a deluxe model that has a stainless steel lid and lifetime guarantee for an additional $7.95 each. 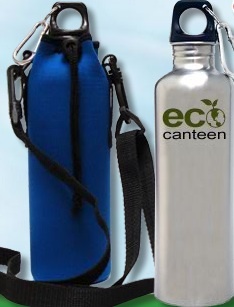 The Kid’s EcoCanteen is $8.95 plus $4.95 shipping/handling and $4.95 shipping/handling for the tote. Never Spill Pull Tops (sports lids) are $4.95 and have no Shipping and Handling. And there is also an offer for rush shipment which is a flat rate of $7.84 in addition to the regular Shipping and Handling. If you would like to contact EcoCanteen with a question, comment, or for help with a Customer Service issue we encourage you to visit us at http://www.ecocanteencustomerservice.com. The site offers FAQs and our Customer Service phone number. Ok, first off, Eco Canteen’s website uses the uber-shady “are you sure you want to navigate away” annoyance-box when yo try to leave their site. That’s a dead giveaway for sketchiness. And I agree with the above posters about Klean Kanteen being a solid alternative, definitely an honorable company that’s been around for a while now. One other brand that’s come into play recently though is WeDrink. Same stainless steel bottles we all know and love, and they go a step further by making heavy donations per-bottle to water relief charities. Planet Zero Gravity sells stainless steel water bottles in a one liter and half liter size. http://www.planetzerogravity.com The half liter size fits in car cup holders, bike racks and kayaks. They help you stay hydrated and reduce plastic pollution. Planet Zero Gravity is a member of 1% For The Planet and support and are members of many sports/environmental organizations. Planet Zero Gravity’s owners are active outdoor enthusiasts and have started the company to help ensure our beautiful planet will be enjoyed and preserved. Lets keep the plastic out of of our oceans, rivers, sidewalks and bodies. Buy one today and you will never need to buy another plastic water bottle again! Planet Zero Gravity offers free, fast shipping. After visiting each site and looking at each company, I agree, Project Earth H2o http://www.projectearthh2o.com is, in my opinion, the best choice. I purchased 4 bottles for my family and they are great. Let me just share with you what we received for $15.99 each TOTAL! Free shipping & handling, a free extra push pull cap and $2.00 of each bottle I purchased was donated to eco charities as well as another pink bottle went to breast cancer research. That is probably why they were just were voted as one of the nations “Top 10 Greenest Companies for 2009.” So not up-charges, no shipping charges, charitable donations and great service. This is not a shameless promotion, just a very satisfied customer! Thanks Project Earth H2o!